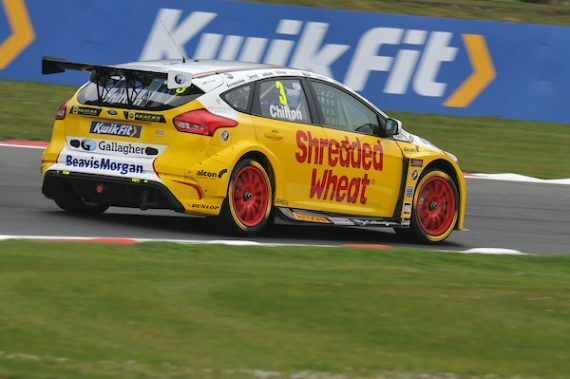 Team Shredded Wheat Racing with Gallagher kicked off the 2019 Kwik Fit British Touring Car Championship season in sensational style at its home circuit, taking victory in the final contest of the opening weekend at Brands Hatch. 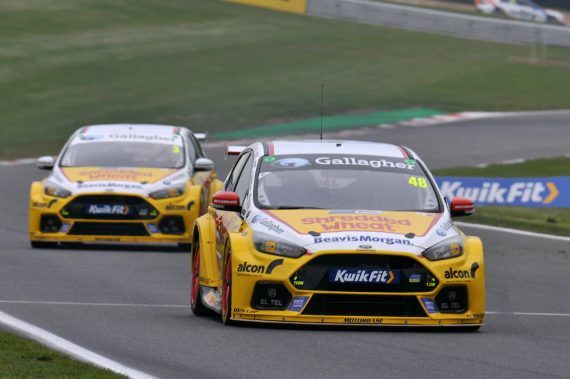 Tom Chilton secured his 15th BTCC career win during an action-packed closing race on the Kent circuit, adding to his earlier 3rd-placed podium and top-nine finish for the Motorbase-run squad during the 2019 curtain-raiser. Unfortunately, Chilton was later judged to have performed an illegal overtake on Matt Neal, resulting in a 5-second time penalty, dropping him back to 2nd place. Tricky racing conditions for the opening round of the season threw-up a conundrum for the grid. With an almost 50/50 split of teams opting to run on either slicks or wets on the damp track, both Chilton and team-mate Ollie Jackson took a risk on the medium compound starting from P13 and P27 on the grid. Banking on the drying track favouring slicks as the laps unfolded, the decision paid off. After initially dropping down the order in the opening laps, Chilton delivered a flawless drive in the #3 Focus RS. Making his way into the top 10 by lap 9, the Reigate-racer then went on a thrilling charge through the field to claim P3 at the flag for his first visit to the podium. Starting from the back of the grid, an inspired drive from Ollie Jackson saw the 34-year-old on a mission. Having made up an incredible 10 places by the mid-way point of the race, Jackson was running in P7 and looking set for a strong top-five finish before disaster struck. Losing power on lap 17 of the 24 lap contest, the Surrey-man was forced into the pits with an electrical issue, recording a DNF. Race 2 proved to be more of a scrappy affair for the Motorbase-duo. With both cars running on the soft-option tyre, Chilton also carried 39kg of success ballast on-board the #3 Focus. A strong start for the Gallagher-backed driver that saw him make a move on Jake Hill as the race leaders charged into Paddock Hill bend was rewarded with a P2 position. Regrettably, it was a short-lived result. After coming under relentless pressure from the charging pack, Chilton defended hard against the lighter opposition but dropped down the order to eventually cross the line in 9th. Jackson’s revival looked set to pay-off in race two. Starting from P28, another outstanding drive saw him scythe his way up into P16, inching the #48 Focus ever closer to a points-scoring finish as the race entered its final stages. Heavy contact on the closing laps, however, saw him grapple with the stricken car, and he did well to bring the RS home in P18. Starting from P3 by virtue of the reversed grid draw, Chilton’s ballast was dropped to 6kg for the final race of the day. Beaten off the line by the fast-starting rear wheel drive cars, Chilton dropped back to P6 at the first corner. A heroic battle back from the 34-year-old, however, saw him reclaim third by the end of the first lap. Chasing down lead pair of Neal and Jelley, Chilton made his move on the BMW on lap 8 to take second place before besting three-times BTCC-champion Neal as the two raced through Clearways on the following tour. With a clear run ahead of him, Chilton took a commanding race win in the #3 Focus RS, and his second visit to the podium. Regrettably, Chilton’s move was deemed as an illegal overtake by officials following the final race, and Chilton was handed a 5-second penalty, with the amended race result recorded as a P2 finish for the Motorbase driver. Jackson’s weekend woes sadly continued. After showing promising pace once more, heavy contact in the mid-pack saw the #48 Focus RS forced into the pits with race-ending damage, recording his 2nd DNF of the day. Having bagged a strong haul of points over the weekend, Team Shredded Wheat Racing with Gallagher left it home circuit sitting in 2nd place in the overall and Independent Teams standings, with Tom Chilton also 2nd in the overall’ and Independent Drivers’ championship points. Speaking after the weekend, Chilton said: ““We’ve had lots of ups and downs this weekend! Saturday was a pretty awful day if I’m honest. Considering all of the work and testing we’ve done in the pre-season it didn’t go in our favour in qualifying. But actually 13th wasn’t the end of the world after all, and we’re coming away from this weekend with two podiums, three top ten finishes and currently 2nd in the championship. “The decision after race 3 was a fair cop! I pushed to pass Matt Neal, and they’ve pushed me back with a 5-second penalty which meant I ended up finishing 2nd overall. Obviously, I’m gutted that I lost the win, but in hindsight, I should have backed off to let him back through. I genuinely hadn’t realised that I had done it until I watched the on-board back. I’m holding my hands up. This entry was posted	on Tuesday, April 9th, 2019 at 8:58 am	and is filed under Featured, Motor Racing. You can follow any responses to this entry through the RSS 2.0 feed. Both comments and pings are currently closed.